Jews view the question through the lens of tzedakah. Often translated “charity,” tzedakah is actually the opposite of charity in important respects. Whereas nobody is compelled to give charity, tzedakah is commanded. Recipients aren’t entitled to charity, but tzedakah recipients are entitled to what’s fair. Mainomides organized tzedakah into priorities and levels of giving. Tzedakah priorities are like concentric circles around the giver, obligating the giver first and foremost to be responsible for himself and his immediate family before seeing to the needs of his more extended family, his religious community, his community at large, his fellow countrymen and, ultimately, people in dire straits across the globe. The lowest level of giving is to give grudgingly. Higher levels are defined by whether one gives after being asked or before, whether recipients are known or strangers, and whether a donor receives recognition or gives anonymously. The highest level of all is giving someone a way to become self-sufficient. Jews are nothing if not pragmatic, and the tzedakah tradition does require the giver to give responsibly, but it is important to note the emphasis on the giver’s obligation, not what the recipient deserves. What does Christian teaching have to say? Jesus left a pretty robust bread crumb trail on this one. We have the socially despised Samaritan who saved a stranger’s life and paid his hotel bill, no less. We’re told much will be required from everyone to whom much has been given. And perhaps most germane to this topic is the admonishment to pay your taxes AND to give charitably. Here again, the Christian tradition emphasizes doing the right thing for the sake of righteousness, not based on the merits of the guy lying in the ditch. To blame the poor for subsisting on welfare has no justice unless we are also willing to judge every rich member of society by how productive he or she is. Taken individual by individual, it is likely that there’s more idleness and abuse of government favors among the economically privileged than among the ranks of the disadvantaged. No one deserved to be born on 3rd base. Self-made millionaires didn’t deserve to be born in the land of opportunity instead of in an oppressive regime. If you want to focus on who deserves what, I would make a case for the hard working immigrants who came to the USA with nothing and made the most of opportunities that came their way, not unlike our nation’s founders, but the current prevailing view is that immigrants aren’t deserving if their parents broke the law to get here. No matter where you stand in the political spectrum, dwelling on deserving leaves us wanting to take something away. Tax wealthy estates. Deport the high school valedictorian. Let poor kids go hungry. They didn’t earn it. We sit in the judge’s seat when we focus on deserving. When we focus on human dignity and human potential instead, we are reminded of ourselves. When we do so with gratitude, we realize our cup is running over and we lift others up out of the abundance of our blessings. The twitter question was not rhetorical. Join the conversation. Is healthcare, food and housing too much to require from those to whom much has been given? This entry was posted in Current Events, Spiritual Practices, Spirituality and tagged consequences, Maslow's Heirarchy, Mitt Romney, tzedakah, Yom Kippur by Stephanie Walker. Bookmark the permalink. You cover some important topics here, Stephanie. Thanks for commenting, Brenda. You touched on so many vital points, I had to let it marinate a while before I could reply. The point that really arrests me, though, is your point about not judging without knowing the whole story. And do we ever know the whole story? A social worker I know, in 6 years of interviewing the caregivers (generally mothers) of abused children, not once met one who had not herself been abused. Not once. Many of the incarcerated women I work with have survived astonishing childhood violence and are in for drug use. As a culture, we’re pretty quick to judge inmates and mothers of abused children without understanding the cycle they’re trapped in. Closer to home, do I really know the whole story with my husband or my daughters when everyone gets home from a long day? You are right that compassion gets us a lot further than judgement. Many religions preach that but how many followers walk it? Thanks as always, Brenda. You add a lot to the conversation. I know many thoughtful Jews who struggle to find a good balance. I myself struggle with this as well. If the tzedakah teaching required us to completely meet the needs of an inner circle before addressing outer circles, one would never reach out to help Haitians, for example, or the Sudanese. But that is not what the teaching says. An atrocity like genocide, even if far away, commands our attention. The Jewish tradition provides a framework for finding a humane and fair balance. What a beautiful, thoughtful post. I believe that food, shelter, and medical care are basic human rights that everyone deserves. It seems that the major religions agree on this point. As far as I know, all of the world’s religions have, “treat others as you would wish to be treated,” or some variation there of as a major tenet. Who wouldn’t want to be feed if he was starving, given shelter if he were homeless, or given care if he were sick? Yes, we are all entitled to food, shelter, and medical care just by virtue of our humanity. It boggles my mind that someone could become so indignant that people think they are “entitled” to these basic human rights. Thank you for your feedback, imperfect. Thank you for your thoughts, too. “Entitled” has certainly become the hot word, hasn’t it? I acknowledge that any established system probably has people who try to abuse the system. I am not saying abuse doesn’t exist, at any rate. I seriously doubt, however, that it occurs on the scale that those looking to justify their stinginess would like to believe. 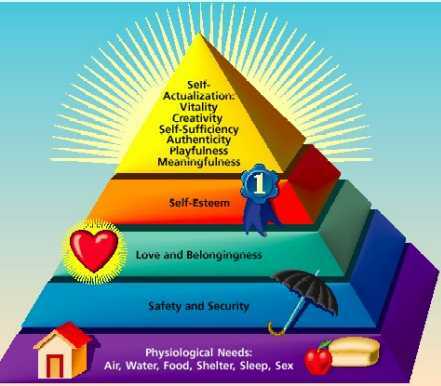 Both Maslow’s heirarchy and the levels of tzedakah suggest we seek self-sufficiency rather than dependence. Thank you again for stopping by to comment!